Does anyone remember the Way of the Tiger adventure book series from the 1980s? My older brother had most of them back in the day and although I didn't play them myself, they seemed really cool. Something about a young ninja assassin who is travelling the world of Orb and is left hanging like Frodo Baggins half way through Return of the King? Yeah! I had the first one Avenger! back in the day and recently pulled it out of the game book box of doom (along with Fighting Fantasy: Sword of the Samurai) The combat moves decision tree means fighting takes up a bit more space than in your average gamebook, but I really like the feel it gives. The black and white art by Bob Harvey is dynamic and exciting if lacking in a bit of detail. Several of the original series covers also turn up in Games Workshops edition of Runequest Land of Ninja. Never really felt the urge to play the rest of the series, but if the first is anything to go by it's pretty solid stuff. Good fun! I shall have to check out Land of Ninja! I havent got to Avenger! yet, but Ninja! seems entirely Japanese in flavour whereas I notice the other books( flicking through them ) seem more D&D territory. Funny you mention Sword of the Samurai as my brother got a copy of a car-boot sale a while back, and I'm tempting to slip him a few quid for it. Was it any good? Interesting that the prequel book (?) is more 'japanese' - are there any Yokai or other japanese folkloric elements, or does it stay focussed on human? I haven't got around to re-playing Sword of the Samura, but from what I remember I enjoyed it back in the day and it was on par with Assasin! - it's definitely in the D&D / Oriental Adventures camp, rather than a purely japanese inspired setting. Yeah, maybe worth a quid or two! 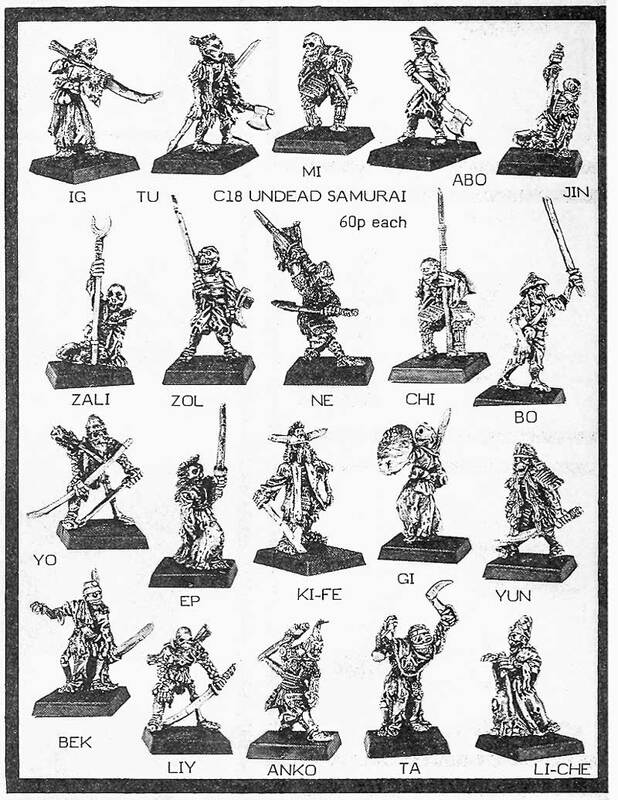 One thing worth mentioning about Sword of the Samurai - the undead samurai on the cover (by Peter Andew Jones) looks quite a lot like the Citadel C18 Undead Samurai - Ne!